Instead of submitting from the Locker, students can also submit from their Device. After clicking the Device button, students will see this screen. Students will clearly see the course and assignment. They can use the button, or drag/drop files from the computer onto the indicated area. You will find all work turned in for a particular assignment in the Assignment Scoresheet. You can reach the Assignment Scoresheet by clicking the name of the assignment either in the main spreadsheet or in the Assignment List in the Gradebook. In addition to submitted work, you can also view any discussion posts that the student has made for that assignment in the Assignment Scoresheet. 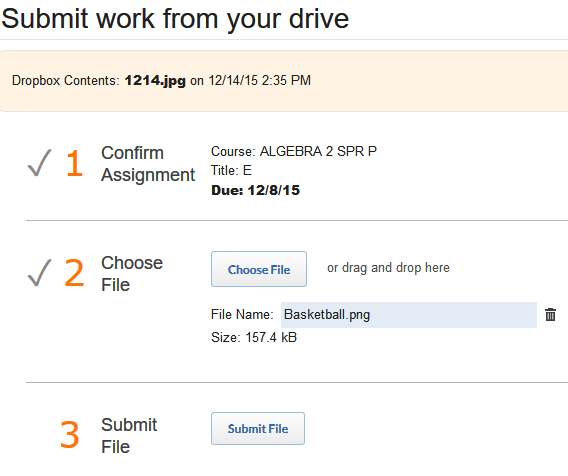 A third way is to click the assignment in your calendar, and then click View Submissions on the View Assignment page. You can also click a student's name within your Gradebook to see a list of all work turned in by that student in the Student Scoresheet. For districts that have decided to turn on Google Drive integration, students can add Google Drive to their locker and submit files directly from their Google Drive. Teachers who have connected their Google Drive to their locker can open and edit these files. The work submitted either from the device or from the Google Drive will be displayed under 'View Submissions'.